ਦੱਖਣੀ ਅਫ਼ਰੀਕਾ ਵਿਚ ਜ਼ੁਲੂ ਦੀ ਭੂਗੋਲਿਕ ਵੰਡ: ਜ਼ੁੱਲੂ ਭਾਸ਼ਾ ਬੋਲਣ ਵਾਲਿਆਂ ਦੀ ਘਣਤਾ. ↑ Spiegler, Sebastian; van der Spuy, Andrew; Flach, Peter A. (August 2010). 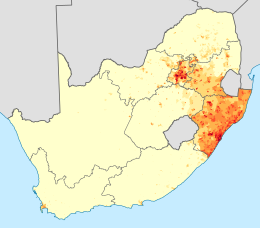 "Ukwabelana - An open-source morphological Zulu corpus". Proceedings of the 23rd International Conference on Computational Linguistics. Beijing, China: Tsinghua University Press. p. 1020.